I was out of town this past Monday, so I wasn't able to make it to the space for our planned study session. The course this week is about probability and inference. This is "some of the most involved material in this class." So I picked a great week to travel and procrastinate on watching the lessons! My introduction to Bayes nets was the second edition of AIAMA. I also really like Jaynes book. He's got a very pragmatic, no-nonsense attitude toward the problem of inference which is really useful for a knuckle-dragging engineer like me. The big question: "can we diagnose the problem?" 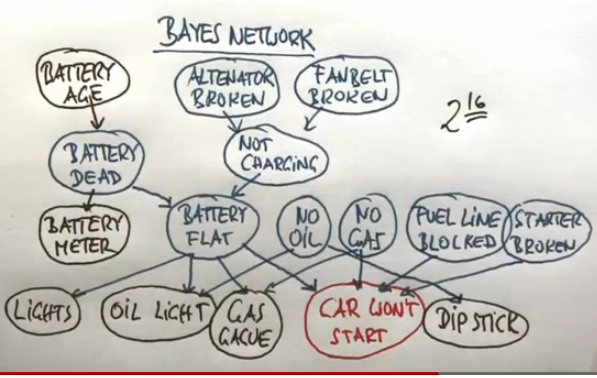 This sort of diagnostic thinking introduced with the influence diagram of car-not-starting problem is a very useful thing for a maker/hacker. Reasoning from observables to hidden causes. Probabilities are the basic tool for managing uncertainty in a wide variety of different AI fields (e.g. vision, robotics, machine learning). I haven't done any programming yet to solve the quizzes or homeworks; I used a spreadsheet to do the simple probability calculations in this lesson (you could easily do them with pencil and paper). Lol I have only watched the very first video. I am so behind, I doubt I will be able to ever catch up. They are about to put me on tons of overtime at work also.